“Conservatives,” “Liberals,” and human nature. It’s my sincere hope that I will get a proper, new post up today (I usually post once a day, though occasionally there will be a second or third little thing) but the huge response to last week’s piece reminding the GOP about the basics of procreation came at a time when I am oddly overloaded with paying work (freelance writer, feast or famine – like that. Here’s my online portfolio, if you’re interested! ), so just in case, here’s a piece I wrote not long ago about who the real Realists are on the American scene – and it’s not conservatives. For a general introduction to the blog, click here. Occasionally I get to thinking. Cogitating, if you will. For the record (and just in case you hadn’t noticed) I am the former (though I tend to use the word “Progressive”). If I try to strip those two words of our daily politics, as well as of all the insults we embed within them, I would say that Liberals tend to be more driven by notions of mutual responsibility than do Conservatives, and Conservatives tend to be more driven by notions of individual responsibility than do Liberals. (Emphasis on the tend). Thus there has long existed a notion of Conservatives as steely-eyed pragmatists, and Liberals as dewy-eyed idealists — you know: bleeding hearts. Hippies. Peace-and-love-and-possibly-overly-optimistic-notions-regarding-the-essential-nature-of-humanity. But I would argue that, in fact, the opposite is true. At least with regard to the essential nature of humanity. With the understanding that I’m speaking in broad generalizations, I think I’m safe in saying that Conservatives tend to have stricter expectations of human behavior, whereas Liberals tend to be a bit more loosey-goosey. As such, Conservatives demand that America spend less on the results of human weaknesses and foibles (drug abuse, unwanted pregnancies, joblessness), whereas Liberals generally demand that we spend more. Conservatives would (I think) say that they’re expecting people to live up to a certain standard, and don’t want to make it easier for that standard to be missed. Liberals would say that standards are often arbitrary and subject to factors outside individual decision-making, and we want to make it easier for people to pick themselves up again when the standard is out of reach. 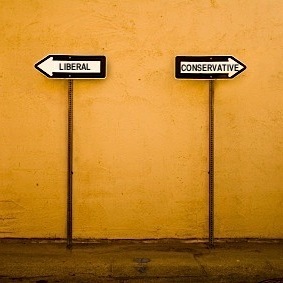 Which to my mind paints the Conservatives as idealists, and us as the pragmatists. Look, I am absolutely a fan of individual responsibility. Each and every person, at the end of the day, must face him or herself in the mirror and own what s/he has done or failed to do. But the simple truth is that we will all fail. All of us. You, and you, and you, and me. All of us. We will all of us do things we regret, make decisions that don’t pan out, and, not for nothing, but continue attempting to live in our easily-broken human form. And we will also, all of us, be failed by others — whether by a boss who decides to close a business, or a parent who couldn’t get it together, or a series of doctors who just didn’t notice that tumor (me! That one’s me!). At base, in our policies and our politics, liberals admit this. We neither hide it nor deny it, but rather attempt to create bulwarks against it. Humans, and human systems, inevitably fail. Rather than punish people for not achieving an immutable standard — with the rather pie-in-the-sky assumption, despite every moment of human history proving otherwise, that people can, in fact, permanently achieve that standard — Liberals would like to acknowledge our limitations, thankyouverymuch, and plan for them in advance. There’s also a larger disconnect between us that I think boils down to Liberals generally being willing to acknowledge that we may not yet know all we need to know in order to solve any particular human problem, whereas Conservatives are more likely to accept accepted wisdom without trying to peel away at the layers. Which (again) suggests to me that Liberals are the pragmatists — not only am I going to fail, but my whole generation is going to fail. Something we take for granted now — something that is as True as The Sky Is Blue — will be proven wrong in the future. Guaranteed. Americans have already realized that we were wrong about women and people of color and the long-term efficacy of re-routing waterways. We’re on our way to realizing that we were wrong about the LGBTQ community, and please God we will someday see some of the hubris we currently bring to the question of body size. We’re a mess, is what I’m saying. And Liberals try to prepare for that, while (many) Conservatives (often) angrily demand that we stop pretending to be a mess, when clearly, if we wanted to, we would never be a mess again. None of which is to say that I think my fellow Liberals (Progressives) always get it right. We sometimes over-compensate, or hold up our own immutable standards (God help the public figure who fails us and then tries to apologize, for instance), or just plain screw up. Sometimes (hold on to your hats) Conservatives get it right. But dewy-eyed? That’s the right. Not us. “Liberals,” “Conservatives,” and human nature.